Hares and Hounds Ultra, Ouch! Man this race hurt. It was the first race of the South East Queensland Calendar and my first race after the off-season and only just over 1 week after New Years Eve. This event was never going to be an easy ultra. The Hares and Hounds Ultra and Relay chase was meant to be a bit of good old hunting fun. The aim was to send out the Ultra Runners AKA the Hares first (53km) and an hour later send out the Hounds in a Relay leg of 25km/25km (50KM) and see who can make it to the end first. The challenge had been set and the chase or the running scared will be on. After Blackall 100km I really cut back on my Ks and just ran for 2 hours at a time, gave myself a rest and enjoyed some faster kilometers on my legs. I’ve leant from my past years to give myself an off-season and to enjoy myself socially, spend time with my daughters and discover new parts of this amazing world. I spent New Years on the magic Moreton Island enjoying Queensland’s best kept secret holiday destination. The sand dune trails were tough, technical and beautiful. I used Mt Tempest as my hill repeat training ground, enjoying the lactic burn, lung busting climb and views of Moreton Island. I may have over done the soft sand running before Hares and Hounds Ultra. The week before Hares and Hounds Ultra I had pretty bad shin pain. It felt kind of like a shin splint. I knew that the lack of shoe rotation on Moreton Island was not the best training lead up for me. I only wore one pair for the 70km that I ran when on the Island. I would normally change my shoes every day. When I entered Hares and Hounds Ultra only 2 days before the event I was sore in my shin. Stuff it. I knew how to get over this injury. I started to switch up my shoes, self massage, wear compression socks, hit the Ultra Sound at Bodyleadership with Joel, massage therapist. As long as I could finish the week of PTing with no shin pain, stay off it, wear different shoes, change my technique slightly and find the sweet spot when running, I should not have a problem at Hares and Hounds Ultra. Hares and Hounds Ultra started at a painful 3:30am. There will be many painful minutes in this ultra. I woke up at 12:15am so I could eat my coconut milk oats and banana, drive to Death Before Decaf in New Farm and grab a coffee and pick up a mate and still arrive at 2;45 am for registration, get weighed in which was an awful experience straight after the silly season. After a shock weigh in and a warm up I was ready to race. 50km is always a funny distance for me. It’s a distance that I don’t like at all. I will be finishing right when I start to feel good in a 100km event. I knew going into Hares and Hounds Ultra that I was going to hurt like hell after 40km. This was the challenge for me. It will test me mentally and physically. The race starts and thankfully finishes at the Woodford Pool as an out and back course, with a 50km relay, 35km, 10km, 5km distances to choose from. I will be looking forward to a post race shower and dip into the pool set in classic Aussie Bush Surroundings. I lined up at the start line, said hello to a few runners and within no time the count down went off and we were off and running into the darkness. Starting under Ay-Ups was a fun and a bit of a novelty. It meant the conditions were cool and there’d be less dirt bike traffic on the State Trails in the Woodford Glasshouse Mountains Area. Off we went along the slight descent down the road, continuing onto the muddy 4WD track, climbing slightly for about 300m, turning left, climbing a wider fire track forming a group with long legged Andy and Duathlon Australian Runner Matt, winner of Blackall 50km. We chatted away, enjoying the trails maybe a bit too much and missed the right turn by about 500m and had to leg it back, realising our mistake, swearing and cursing, flashes of Kokoda Challenge was coming back to me. 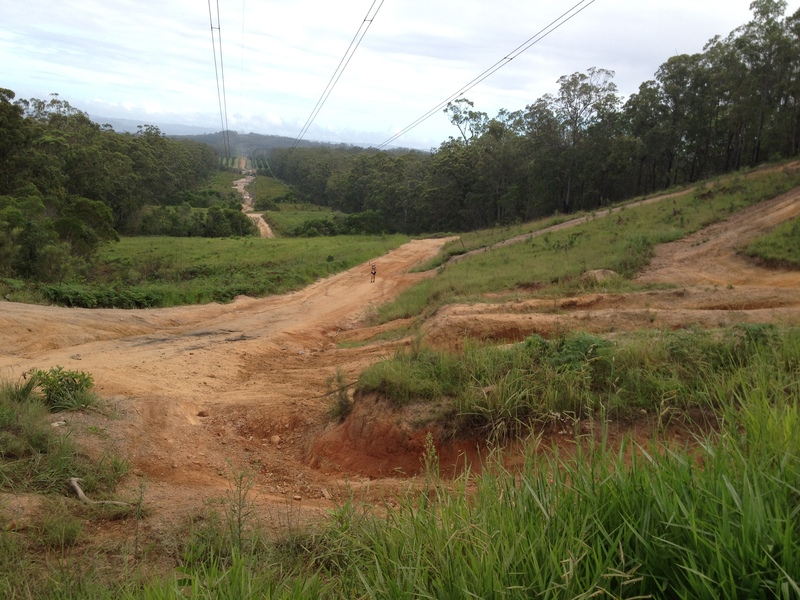 I’m new to trail running up in Queensland, I understand the races are smaller, but 250 runners is still a decent amount of runners to want to look after and a simple ribbon or marshall at key junctions would really go a long way to preventing runners from getting lost. Apparently later in the race on the return many runners followed the arrow and turned left and completed an extra loop in the last 1km of the event. Is this is trail running and getting lost is part of the adventure? Or should there have been a sweeper out on the course taking down the out and back markers to prevent confusion especially in the late stages of the event? Was athlete safety taken into full consideration? Matt, Andy and I made a quick U-Turn realising our mistake and within a few hundred meters was back on the correct track, avoiding a massive short cut and followed the correct route, catching every 55km runner in our path. I let Matt set the tempo and I followed him, pacing off him, saying “Hi” and chatting to the runners, passing my UTA clients in the run of lost trail running shame. After a few turns, more chatting we soon dropped Andy and it was just Matt and I running together out in front with no one to be seen behind us. We cruised long together chatting away, navigating together, swapping race stories and in general having a good old time. We past through the 2nd check point and I swapped water bottles with my support crew member UTA client and kept powering on with Matt. Hares and Hounds 55km run in this fashion was way more like a training run than a race. Matt would run ahead when he needed to pee and be finished by the time I caught up with hi so our pacing could continue. When I needed to pee he eased off the pace a bit and allowed me to catch up. When do I get to race and pace off such a gentleman? This was awesome! Much like Lamington Classic Male Runners. The blokes up here are so polite when racing. I soon caught up with Matt at 21km and looked down at my watch and it said 1:40 for 21km. Sweet. I’m on track for a nice tidy 55km here. We cruised on together down the big dipper and into the turn around. The scale monitor gave Matt a bit of grief with his weight loss. He was about to give me grief too. I’d lost 2 kilos on the scales, just pee’d plus all the other pee’s I’d done pre-race, sweating and energy consumption in my muscles so 1.5kgs loss did not seem that bad. “Come on mate I weight 55kgs with my kit on at the start, I’ve drunk it all now it’s 53kgs. I’m only little let me go”. I instructed. With this stated I was off and running chasing down Matt, spotting Andy and 2 of the pursuing males reeling me in the distance. I caught up with Matt but with the blokes spotted in the distance it was game on for him. He can run a 31min 10km off the bike in a Duathlon so I knew he was going to stretch his legs eventually. I pushed on, feeling good, saying “Hi “to all the runners I could see and counting Time and Kilometers between myself and the next females chasing me down as I climbed steadily out of the valley. I don’t know what it was, maybe I’m so easily distracted but in this out and back section the wheels fell off a bit. I forgot about my electrolyte plan and I started to stiffen up. Realising my mistake I started to pump in the electrolytes, I’d run out of my usual trust Hammer Endurolyte’s and I was paying the price. I dig deep and push harder up out of the valley, trying hard to chase down Matt. Around the 35km mark my right quad was killing me and I was past by two blokes like I was standing still. My lack of Ks and the increased red wine consumption over the Xmas break was catching up with me. At 40km I had to stop and walk for 10 steps, let out a cry, dig deep into my rib cage and try to pressure point release my abs, diaphragm muscles. I was working so hard through my ribs, breathing deeply, giving myself asthma, stressing out my obliques, cursing my running belt, wishing I had on my trusty Inov-8 Race Ultra Vest and hurting like hell. I did my best to try and relax and had to pull off the pace a bit because the pain I was feeling in my ribs was so intense and preventing me from breathing properly. I hit my electrolytes hard and decided to reduce the glucose consumption, give my stomach a rest and see if the less is more approach would help. I spotted the 10km runners at the 5km turn around and decided to use them as pacers until the finish. One by one I reeled them in and just counted my steps and did my best to ignore the pain and fatigue I was feeling. I ran past my earlier navigational mistake and noticed there was still an arrow out from the start of the event and rolled into the finish line, turning right and running into the Woodford Pool in 4 hours 37 minutes or there about’s because I never turn off my watch in time and I started it 2 minutes early. Done. Xmas Detox run completed. 53km 4 Hours 37 minutes and back on track for my Tarawera Ultra Training. Time to hit the shower and jump in that pool.